Nachos and cheese are a favorite snack for home and local events. However, serving the soft cheese can be very messy. This is a guide about serving nacho cheese. Does anyone have any idea how to dispense cheese for nachos without having a mess. We don't have a regular cheese warmer with the pump on it, so we usually heat the cheese in a crock pot and dip it out but that is so messy and we waste a lot that way. I have no idea if this would actually work, as it would depend on the thickness of your cheese sauce when heated, but would a large turkey baster work? Try a ketchup squeeze bottle. By cutting off some of the tip to let the melted cheese come out, you can squeeze out as much/little as you want. once it has been heated pour into a pitcher and keep the pitcher in a couple inches of water in an electric skillet on low heat. then you can pick up the pitcher as needed and pour it out and return it to the skillet. I just spent the past week helping at my church's youth camp. We had a snack shack in the evenings where the campers could purchase burgers, nachos, etc. We heated our nacho cheese in a crock pot and just dipped it out with a long handled metal ladle. I would say it held maybe 1/4 to 1/2 a cup of cheese, so it was probably what you would call medium sized. It wasn't very messy and it worked well. You might want to try it. I usually heat cheese in a pyrex liquid measuring cup in the microwave. The measuring cup makes pouring easy because it has a spout. I usually set it on a plate after pouring to avoid little cheese drips on the counter. I don't know if you can buy this in a store, but in our drive inn restaurant, we buy 3 ox. packs of nacho cheese in a plastic pouch. When we need some for an order, we lay a package just under the edge of the grill, and when the resr of the order is ready, the cheesd is hot. If you can't find it is the grocery store, maybe you could buy it at the grocery company and split a case with a friend. They're good, quick and easy. Our organization runs a food stand once a year as a fundraiser at a Rough Truck event. A big seller is nachos and cheese. 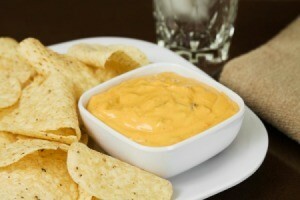 Does anyone have any ideas on how to keep the cheese hot and how we can "pump" it onto the nachos. Using a spoon is so messy. We borrowed an extra dispenser from a local restaurant, but they no longer have one we can use. We checked prices on a regular dispenser, but they are too expensive for us to invest money in to only use once a year. Any suggestions?